So wrote Rudyard Kipling of an artillery draught horse. In the beginning of the 18th century, the art of riding was almost exclusively influenced by the French, and it was the great riding master de la Gueriniere who produced the most revolutionary book on riding of all times, based on clarity of writing, of simplicity and facts to be completely understood by the reader. His techniques of riding are applied unaltered at the Spanish Riding School in Vienna and the basis of modern riding in Europe today. During the Napoleonic Epoch, the horse was indispensable in moving ordnance and stores from depot to battlefield. The field artillery of the Napoleonic epoch was designed to be mobile. When French or troops of other nations marched across country, the guns moved with them. During battle, the guns were moved to assigned positions and then were switched from place to place, pulled back or sent forward as fortune demanded as the battle waxed and wained. The horse batteries went galloping off to support an advance or repel an attack. When they withdrew, they contested the field as they went. Movement was everything. The guns could fulfill their essential function only when they could be moved where they were most needed. The horse for artillery service should be from five to seven years old (the latter age to be preferred), and should be from fifteen to sixteen hands high. The saddle horse should be free in his movements; have good sight; a full, firm chest; be sure-footed; have a good disposition, with boldness and courage; more bottom than spirit, and not too showy. The draft horse should stand erect on his legs, be strongly built, but free in his movements; his shoulders should be large enough to give support to the collar, but not too heavy; his body full, but not too long; the sides well rounded; the limbs solid, with rather strong shanks, and feet in good condition. To these qualities he should unite, as much as possible, the qualities of the saddle horse; should trot and gallop easily; have even gaits, and not be skittish. The most suitable horse for the pack-saddle is the one most nearly approaching the mule in his formation. He should be very strong-backed, and from fourteen to fifteen hands high. In France General Gassendi, recommended that the horses of the artillery train teams be large, solid and strong animals, 4 to 9 years of age. Mules were to be 1.39m (13.3/14hh) to 1.59m (15.2hh) at the withers, and to be 3-10 years old. The horses destined for the light cavalry were to be no smaller than 1.48m (14.2hh) at the wither in the anciene regime, but by 1805 this was reduced to 1.38m (13.3/14hh). The horse artillery riding horses were to be 3-5 years of age and 1.529m to 1.57m (15hh to 15.2hh) at the shoulder. Thus the horse artillery had the better horses than the light cavalry who rode riding ponies rather than a horse. The riding horses of the artillery train were to be 1.48m to 1.52m (14.2hh to 15hh) at the withers. The riding horses for the horse artillery it was recommended to come from Calvadoes, La Dyle, L’Eue, La Manche, La Meuse, L’Ourte, L’Orne and La Seine. The train horses were to be from Ardennes, la Central, La Correze, Le Finistere, Le Morbihan, La Nierve, Le Nord, Le Puy-de-Dome, Les Pyraness, La Haute-Vienne. There is little information on artillery horses used by other nations. Artillery was as dependant on the horse as the cavalry if not more so. As the principle motive power for the guns, they were a prime target for the opposing force; disabling the horses meant that the guns were at risk of capture. Horses, like the soldiers who depended upon them, were also subject to the rigors of disease, poor rations, and the too-often squalid living conditions of an army camp. The death toll has never been calculated, but the cost of the War in horse flesh was surely enormous. During the advance into Russia in 1812 Chef du bataillon Boulart of the Artillerie a Pied de la Garde Imperiale recounts that a quarter of his two batteries team horses died in a single primordial deluge of cold rain, perhaps 10,000 to 40,000 horses being killed in this one incident for the entire Grande Armee. The large number of horses posed a logistical challenge for the artillery, because they had to be fed, maintained, and replaced when worn out or injured. Artillery horses were generally selected second from the pool of high quality animals; cavalry mounts were the best horses. The life expectancy of an artillery horse was under eight months. They suffered from disease, exhaustion from long marches (typically 16 miles in 10 hours), and battle injuries. As their lives and guns so often depended upon their horses, artillerymen were disposed to accept without excessive grumbling the regulations for their care. The trumpeter would sound stable call after reveille and roll, and water call after breakfast. The same routine for the horses would be repeated late in the afternoon. Morning and afternoon drill also meant a workout for the horses, after which they needed to be walked to cool down, curried, and probably watered again. There were always sick horses requiring care, and those who died requiring burial. One driver was assigned to each pair of horses, riding the on (left) horse and holding reins for it and the off horse. Skilled riders were required for this service, which combined the daring of the cavalry troopers, with the precision teamwork expected of the artilleryman and compassion and care for the horses in their charge. Drivers were could be issued with a leg-guard, an iron plate encased in leather and strapped to the right leg to prevent the limber pole from injuring them. Each driver had two horses and their harness under his care. Each rode the left horse of his team and was held responsible for the feeding, watering, and grooming of the team. They were usually picked for this duty because of their knowledge or skill with the animals. During battle they brought the ordnance into position under the direction of the Sergeant, who was the platoon guide and was mounted individually. The caisson drivers were directed into position by the chief of line of caissons, frequently taking position under hostile fire. Keeping the horses calm during battle and removing harness from downed horses was a skill of the drivers often used. The drivers had to be alert at all times in case the ordnance had to be removed from its position in haste, the ear ever waiting for the trumpet call to marche. However, once the foot artillery battery line was established the drivers would often dismount and lay on the ground with their reins in their hands, depending on the amount of hostile fire being received. This was not possible with horse artillery which would change positions rapidly, and in some cases so did foot artillery batteries. Though they were not 'up front', the drivers and horses were still killed and wounded, and rounds shots passing close to a battery would cause consternation among the drivers trying to control horses just in rear of the main battery line. The only drivers that were not usually with the battery in battle were those that drove the traveling forge and battery wagon. This equipment was usually in the rear of the army on the march. The horses were worked hard and long, but it had to be so. A battery racing to catch up with a retreating enemy or to gain a position of advantage had no room for gentle treatment. The stakes were high, and the horses paid the price. The alternative might be defeat. A man on a long, hot march, pushed beyond what his body could bear, might drop out temporarily and catch up with his company later. Horses had no such choice. Harnessed to the limbers, they pulled until they fell or, as happened in most instances, until they harmed their bodies beyond healing, and then were shot becoming the drivers and artilleryman’s next meal. Mud or dust seemed to plague every movement of troops. Of the two, mud was the greater problem for the artillery. Dust created great discomfort, but little more. While an artilleryman might find it difficult to breathe and intolerably itchy in the suffocating dust, the guns and caissons could still be moved. Mud, on the other hand, often made movement impossible. Sinking below their axles in holes full of clinging muck, guns and caissons could be moved only with superhuman effort, the men pushing at the wheels and extra horses pulling on the traces. Sometimes guns and caissons were simply abandoned to the mud. During the 1812 and 1813/14 campaign, teams were often doubled to draw guns into position. A battery would ideally move at the same speed and covered the same distance as did the troops to which it was attached. This distance could be anywhere from a few miles to 20 or 30 miles a day. When a battery moved independently, it was not limited by the movement of the troops and was thus free to cover as much ground as it could. All in all, there was not a great deal of difference in the distance travelled. Such gains as there were resulted from the absence of thousands of marching infantrymen, supply trains and other units cluttering up the roads. The battery was then able to travel without long delays due to the inevitable traffic jams caused by jostling troops. The capacity of a healthy horse to pull a load was affected by a number of factors. Chief among these was the nature of the surface over which the load was being hauled. A single horse can pull 900 kg on a smooth road and 1500 kg 20 to 23 miles a day over a hard-paved road. At the trot, on a good road, this is reduced to 420 kg . Gassendi noted that on a road a convoy of artillery could cover 0.94miles in roughly an hour, and that a horse carrying 75.6 kg and drawing 315 kg could travel on average 20miles a day. Drawing capacity is based on each horse in the team drawing 900 kg . The offside horses drawing 450 kg . This is for both wheelers and leaders. The third pair of horses in a 6 horse team, not being directly attached to the gun only provide 3/4 of their potential drawing capacity.Weight of system from d'Urtubie 1786. The pulling ability was further reduced by one-half if a horse carried a rider on its back. Finally, as the number of horses in a team increased, the pulling capacity of each horse was further reduced. The capacity of a healthy horse to pull a load was affected by the nature of the surface over which the load was being hauled. A single horse can pull 1360- kg at 32-37 km per day over a hard-paved road. The weight dropped to 860- kg on hard ground, and reduced to 500- kg over rough ground. This was further reduced to half the horse carried a rider on its back. As the number of horses in a team increased, the pulling capacity of each extra horse is reduced. A horse in a team of six had only seven-ninths (78%) the pulling capacity it would have had in a team of two. The goal was that each horse's share of the load should be no more than 318- kg thought this was seldom achieved. A battery moved at the same speed and covered the same distance as did the troops to which it was attached. This distance could be anywhere from a few km to a forced march of 32-48 km per day. The goal was that each horse's share of the load should be no more than 350 kg . This was less than what a healthy horse, even carrying a rider and hitched into a team of six, could pull, but it furnished a very important safety factor that allowed for fatigue and losses, resulting that a team of four could draw a fully loaded Girbeauval 12-pdr. The above table clearly shows that the French artillery equipment of Gribeauval had ample horse power to move the equipment over smooth hard roads. Indeed a 12-pdr is able to be moved by a pair of horses, as demonstrated by the recreated horse train of L’association Britannique de la Garde Imperiale. Of interest the table shows that the 8-pdr was as mobile as the 4-pdr in terms of weight per horse, which probably influenced the guns adoption as the principle weapon of horse artillery in favour of the 4-pdr. In order to apply the tractive force of the team to the gun, the horse had to be connected to it with a harness. Horse teams consisted either of four or six horses. The two horses at the front of the team were called leaders’, the two attached to the limber the wheelers. In a team of 6, the middle pair of horses were called the centre horses. All the horses to the right of the toungue or shaft were called off horses and carried a light pad saddle in the English artillery apparently, or in the case of Prussian artillery in the 1813 a riding saddle on which gunners could ride. The horses to the left of the toungue or shaft were near horses, and each were ridden by a postillion driver. The harness for the off and near horses were the same, but differed for leader/centre horses and wheelers. It was recommended that all possible liberty should be allowed the horses when harnessed, in order that the action of one may not shackle the others, that accidents may be as rare as possible, and that killed and wounded horses may be replaced easily and promptly. Three general types of draught were used in the Napoleonic epoch. The horses are arranged in single file and is well suited to drawing heavy loads over narrow roads. However it is not suited for rapid movement over ordinary roads as much of the tractive force is lost by the continued change in line of traction incident a long column. Also, in this mode of attachment using shafts, only one horse is coupled directly to the limber, thus the remaining are attached to each other, so that the second horse in line applies only ¾ of its drawing potential, the next ½, thence ¼, so in a single line of more than 4 horses, the remaining horses provide little or no potential draw to the team. The horse in the shafts, which by constant fatigue is quickly rendered unserviceable. In the second method, the horses are attached to the gun in pairs, in double file, a wheel horse being placed either side of the central shaft or tounge, which is attached to the axel tree of the limber. The tounge is supported and kept steady by the pressure of the body of the carriage on the sweep bar, which projects beyond the rear of the limber axel tree. The centre pair in a team or six or leaders in a team of four are attached to a splinter bar at the end of the tounge. In Lichtensteins limbers were provided with swingle-trees and movable splinter-bars, like a contemporary stage coach, with a view to give the horses all possible liberty of motion when in harness. The object of making this splinter bar movable was to equalize the draught between the two wheel horses, one which works more freely than the others. In the Gribeauval system, the splinter bar on the limber was fixed, and a single movable splinter bar retained at the end of the tounge or sweep bar. The fixed splinter bar was held in place by two bronze nails. Two iron rods, or hames, passed from the splinter bar to the axel block. This transmitted the tractive effort from the horse team to the axel block, the strongest part of the limber, unlike the Austrian system, where it was passed to the A frame and thence to the axel block. In both Austrian and French system the splinter bar on the extremity of the toungue could be unhooked from the toungue, and the pair of horses attached to the gun carriage directly for forward or rearward movement by a length of chain or a rope called a Schleppseil. The Desaguliers limber design omitted the sweep bar behind the limber axel tree, to facilitate attaching and detaching the gun carriage. Rather than the weight of the tounge, ammunition and carriage being split between the gun and limber, the weight was transmitted to the end of the tongue which was supported by the horses. This was a serious inconvenience in long marches. In oder to overcome this lack of a sweep bar, the splinter bar and swingle trees at the extremity of the tounge were removed. This however effected the draw potential of the horse team that could be applied to the limber. The wheel horses were attached to a fixed splinter bar, and the traces of the centre or lead horses are attached directly to those of the wheel horses, however as the traces are not connected directly to the limber via the splinter bar on the tounge, they only apply ¾ of their potential draw power, where as formerly these centre or lead horses applied 100% of their draw potential to the limber as they drew directly on the limber and not the traces of the wheel horses. Thus in those mode of draught 6 horses exerted on a good rode 3037 kg of force, compared to 3712 kg of force when the centre or lead horses were attached to the toungue via the splinter bar and swingle trees. The only complete description of artillery harness for the Napoleonic era, is that of the French harness. 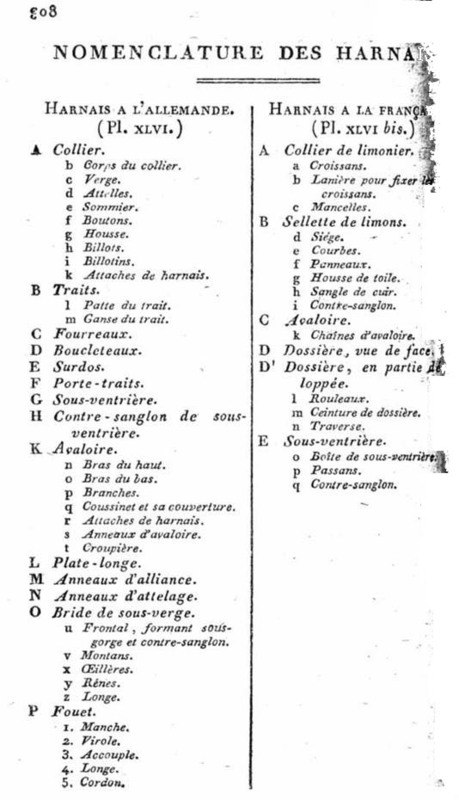 The French used the German or French system of harnessing, which used the same basic elements, described below after Bardin 1812 and Gassendi 1819. The German style full harness for 4 horses comprised 2 front traces and 2 rear traces. The harness of the drivers comprised dragoon pattern saddle and accessories i.e., holsters, straps, loading straps, stirrup irons and leathers, bridle, bit and reins. The off side wheeler horse, known as a 'sous-verge' (the unridden horse on the right of the driver), consisted of a halter with tether, a bridle with blinkers and a pair of reins, a cover in strong grey cloth and a backband attached to the sheaths of the traces, plus similar collar, tether, 'avaloire' and saddle girth as the driver. The crupper was longer and fastened onto the bridle reins. Front harnesses were similar, but did not have the “avaloire' strap or flat tether. The harnesses described is taken from the handbook for artillery officers of 1809 by General Gassendi. The wooden part of the collars were painted Olive Green. The 'avaloires', flat tethers, backbands, cruppers, halters and straps of the “sous-verge” horse were all of natural Hungarian leather, the sheaths of the traces, the breaching strap and flank strap were made from a tougher hide. The saddle was not originally covered, but given holsters at the beginning of 1805 and a white wool shabraque with iron grey decoration and a surcingle. A white braided croupelin cover was often added. It was decorated with white grenades. 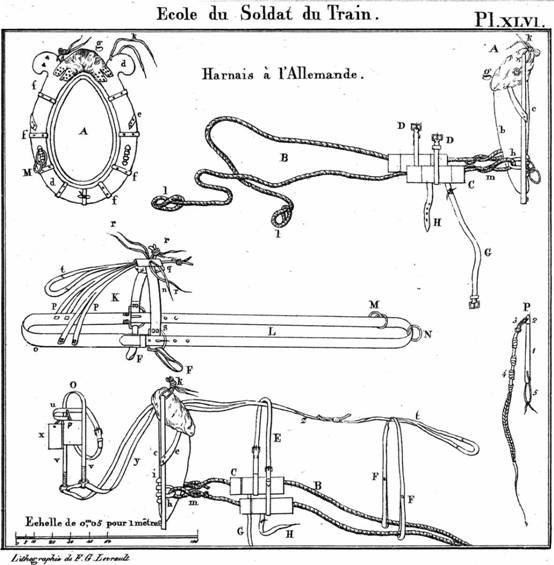 According to the Sauerweld Manuscript, the drivers of the Foot Artillery Train had the holsters and croupelin saddlecloth of iron grey with white braid and grenade in the corner. The drivers of Horse Artillery Train had a dark blue tight cavalry shabraque with red braid, grenades and a dark blue round portmanteau. N.C.O.s and bombardiers must have had the full dragoon style harness with the croupelin saddlecloth and holsters or a half-shabraque. All of the horses used by the artillery team in draught wore a double bridle. The first part consisted of a head collar (le Licol), nose band, throat lash and cheek pieces. It fastened off side with a buckle, a bridoon bridle (le Filet) consisting of cheek pieces head piece and brow band and a second bridle (Le Bride) for the snaffle bit (mors), consistsing of head piece, brow band, cheek pieces, nose band and throat lash. Winkers may have been used on the off side horses. The head collar had stitched to it a leather tethering rope. The near side horses had black bridles and offside horses brown or natural vegetable tanned leather bridles, both with brass buckles. This was a head collar made from natural leather of white canvas. It was designed to allow a bit to be fitted to the rings at the bottom of each cheek piece by a T bar on a piece of chain at each end of the bit. This enabled to the horse to be ridden bar back to the place of watering, the bit to be removed, the horse allowed to drink, and then walked or ridden back to camp. This was often done in pairs. - The service head collar was constructed in such a way that it can be used either as a bridle or as a head collar in the stables and on the picket line. The crown loop is a small piece of leather, consisting of two loops which connect the cheek piece and throat lash at the top of the bridle on the animal's poll. The brow band consists of a leather strap with two loops at each end, through which both the cheek piece and throat lash pass, and over these loops lie the tabs, which are small leather straps stitched on the brow band and fastened by a brass stud which is sewn into the loop of the brow band, through which the bridlehead passes. The object of the brow band is to prevent the cheek piece and the throat lash from slipping backwards. The object of the tab is to hold the bridlehead in position. The cheek piece consists of a strap of leather sewn on at one end of the square which connects the nose band and back stay together on the near side. At the other end it is punched with holes for securing to the buckle of the buckling piece. The throat lash consists of a plain leather strap with a buckle at one end and punched with holes at the other for adjustment. The throat lash secures the bridle on the animal's head. Each horse in the team wore a large neck collar which transferred the tractive force of the horse to the traces . The collar was cut from a single piece of oak or ash. The inside of the collar was fitted with a leather tube filled with straw or horse hair to act as padding. The front of the collar was fitted with 7 radially placed iron plates around the bottom of the collar to act as reinforcements. Level with the horses shoulder on each side and in the centre bottom front was an iron ring fixed to the collar. Through these rings served to carry the wither strap from the harness. Behind the two side rings, the traces were attached through an iron staple. At the top of the collar a sheep skin padd was fixed to stop the collar rubbing the horses’ neck. The collars were interchangeable, but needed careful fitting through the addition or removal of padding. The saddle used by the drivers and mounted members of the Train was the standard Dragoon saddle. The Dresden MS shows the use of light cavalry or Hungarian saddles by the train troops attached to the horse artillery. Used in the German and English system of harness, this consisted of a simple pad with leather falls. Attached to this were baggage straps. It was held in place with a special girth, and also carried straps for the flank straps. The front carried a hook for the bearing rein and staple for crupper and loin straps. The crupper served to prevent the saddle moving forward. It attached to the back of the saddle. The draught harness consisted of traces and breaching straps. The traces transmitted the tractive effort of the horse to the vehicle being drawn via the swingle trees. The traces were made of four strand hemp rope, furnished with rope loops at their terminals which looped onto the swingle trees. The traces were supported by a leather loop at the D buckle connected the wither strap to the breaching strap (avaloire). Around the horse passed two large pieces of leather, the breaching strap and wither strap. These acted as the break for the gun. The wither strap, connected to the breaching strap via large D buckles, held up by a loin strap, which passed over the hind quarters of the horse, and the through the crupper. The wither strap was a single length of leather which passed around the front of the horse, through the iron rings on the neck collar and secured at each end to the breaching strap. The wither strap was provided with leather tubes to take the traces where they passed below the saddle, and over the stirrup leathers and girth of the near side horse. A flank strap supported both the traces and wither strap. A double or single loin strap passed over the horses’ rump. The off side horse had a back strap which connected the top of the neck collar, passing to the flank strap, and thence the crupper at the loin strap. On the near side horse, this strap passed to the front of the riding saddle. The leading and centre horses did not have the breaching strap or loin strap. The traces terminated in iron hooks with connected to the wither strap rings on the proceeding horses neck collar. All plants and animals depend on energy to sustain them, derived from food. Nearly all foods provide the consumer with energy for normal cellular activity, or energy that can be stored for use at a later time. Our ability to feed the stable horse successfully on a dry and highly concentrated diet is a highly specialized art, which has been developed and perfected over many generations, as a result of practical experience and scientific study. Grazing is the natural system of feeding, and it is the successful adjustment of the natural to the artificial, lies the whole are of feeding the stabled horse and pony. Foods are composed primarily of carbon, hydrogen, oxygen, and in the case of proteins, nitrogen. The molecular bonds found within foods are relatively weak and provide little energy when broken. As a consequence of this the energy resulting from the food is not used directly for cellular operations, rather that energy in the food molecules bonds is chemically released with out cells and then stored in the form of a high energy compound called Adenosine Triphosphate (ATP). The formation of ATP, provides the cells with a high energy compound for storing and conserving energy. The energy required to sustain the exercise can be obtained from several sources including carbohydrate, fat and to a lesser extent protein. Typical equine diet tends to consist of approximately 5% fat, 7-12% protein and the remainder in carbohydrate, showing this as the main energy provider. Hay is the main provider of carbohydrate in equine diet, with oats in our instance being the protein provider. Muscles in the body depend on carbohydrate, and the dependence on carbohydrate is related to carbohydrate availability and the muscles development of the carbohydrate metabolism system. Carbohydrates are converted to glucose, a one unit sugar – monosaccharide which is transported in the blood to the body’s tissues. There are two types of carbohydrate available for energy production, structural carbohydrates and non-structural carbohydrates. Structural carbohydrates are found within fibre and can be digested in the hindgut by microbes, producing volatile fatty acids. The non-structural carbohydrates are starches and sugars. These can be found in grass in the form of sugars and in cereal grains as starch, both of these provide glucose for muscular work. Under resting conditions, ingested carbohydrate is taken up by the muscles and liver and then converted into a more complex sugar molecule called glycogen. Glycogen is stored in the cytoplasm until the cells are required to transform it into ATP. Carbohydrates have three main functions, the provision of rapidly available heat and energy; reduces the consumption of protein when there is an adequate supply of Carbohydrate as well as providing a store of energy when eaten in excess and converted to fats. Fats provides a sizable amount of energy during prolonged less intense exercise like dressage, muscle and liver stores of glycogen are limited, so the use of fat reserves can delay exhaustion. Fats consist of carbon, hydrogen and oxygen, and differe from carbohydrates, in that the hydrogen and oxygen are not in the same proportion as water. Body stores of potential energy in the form of fat are larger than the reserves of carbohydrate, but fat is less accessible to metabolism because it must first be reduced from its complex form, triglyceride, to its basic components, glycerol, and free fatty acids (FFAs), only the later being used to form ATP. Substantially more energy can be derived from fat than from the same amount of carbohydrate, but the release of the energy is far slower, and cannot meet the demands of intense muscular activity required by show jumping, but contributes more to low level prolonged activity such as dressage . Oil is becoming more popular to fed to horses now as it does not make the horses excitable, as some straights and compound feeds can and also adds very little heat load to the horse. Feeding oil to horses over a prolonged period of time enables the horse to become more efficient at metabolising muscular and liver glycogen supplies, which in turn improved performance. Another reason for the increase in fat usage is that it has a glycogen sparing affect; this delays the decrease in blood glucose levels and so delaying the onset of fatigue due to lactate production. When oils are fed, as they contain up to 3 times more energy than oats, less starch can be fed. This can aid in preventing nutritionally associated disorders such as colic, tying up and laminitis. Protein can also be used as an energy source, but it must be converted first into glucose via Glycolysis and can supply up to 10% of the energy needed to sustain prolonged exercise. However, they are only used when all carbohydrate and fat reserves have been utilised. The role of protein appears to differ for endurance and high intensity exercise, the former placing a greater demand on protein reserves as an secondary energy source and the later is needed to build muscles. The muscle fibre types used by the horse for various activities will influence the energy source that is required. The structure of these fibre types depends on the individual horse and the work being done. Slow twitch fibres work aerobically and are used for low intensity and more prolonged work. Fast twitch fibres are required when the horse performs a higher intensity of work, moving on to fast work. There are two types of these fibres, type 2A and 2B. The type 2A fibres work aerobically to release energy and the 2B fibres work aerobically to produce energy, resulting in lactate production leading to fatigue. No single energy source or muscle fibre types is utilised alone. They are all linked and work alongside each other to provide the optimum amount of energy for the work being done. The muscle fibres rely on different fuels for their uses. These energy sources are provided through either forage or concentrates, also known as hard feed. Forage is important for the provision of fibre and fibre in this form is known as long fibre. Forage can be provided in the horse’s diet in forms such as grass, haylage, hay and chaff or forage replacers. Concentrates are added to the diet in forms of straight such as oats, barley and maize or as compound feeds such as cubes and mixes. The compound feeds used are a balanced feed, which contains several of the straights in a complete ration to aid in the ease of feeding. These are now becoming more popular than feeding straights. As the work load of the horse increases, the fibre ration is reduced and replaced with concentrates to provide more energy. The theory of the chemical energy intake states that energy taken in and then converted to mechanical energy for work within the cells of the muscles, dictates that different levels and types of work require varying levels of energy intake. Energy is derived from a number of sources, such as glucose, glycogen and fatty acids which are ingested for conversion to ATP for work, with glucose and glycogen being used for quicker energy release and fatty acids being used for slower work but being able to produce ATP for long periods of time. The horse needs to generate energy in the form of ATP for work. The quickest method of generating ATP is through the bonding of creatine phosphate. As there are only small amounts of creatine phosphate available in the muscles the stores are depleted after a short time so other methods of ATP production must be used for longer periods of exercise. The most complex way of producing ATP is through the oxidative system, the process by which the body disassembles fuels and transforms them into energy with the aid of oxygen. This oxidative production of ATP occurs within special cells called organelles: the mitochondria. These are adjacent to the micofibrils in muscles, and are also scattered through the sarcoplasm. In order to function, muscles need a constant supply of energy to continuously produce the force needed during activity, either high or low intensity. During high intensity exercise like eventing, once the stores of creatine phosphate (CPr) have been depleted aerobic metabolism of energy is used. The oxidative system has a large energy yielding ability, meaning that aerobic metabolism is the primary method of energy production during endurance events. This is achieved through the conversion of glycogen into pyruvic acid and then a compound called acetyl coenzyme (acetyl CoA). Once formed the Acetyl CoA enters the Krebs cycle, which is an intricate series of reactions that allows oxidation of Acetyl CoA. Upon completion of the Krebs cycle, 2 mol of ATP will have been produced and the substrate will have been broken down into carbon dioxide and hydrogen. The Krebs cycle is linked with the electron transport chain, which is a series of reactions. The hydrogen released during the previous processes in combined with two enzymes, nicotinamide adenine dinucleotide (NAD) and flavin adenine dinucleotide (FAD) these two enzymes carry the hydrogen to the electron transport chain where they are split into protons and electrons. At the end of this process, the H+ combines with the oxygen molecules, resulting in the formation of water, which prevents acidification in the muscles. The electrons formed in this process pass through more reactions and provide energy for the phosporylation of ADP, resulting in the formation of ATP. Oxidative metabolism is efficient and provides on average 39 molecules of ATP to one molecule of glucose. Aerobic metabolism can also have a glycogen sparing affect if free fatty acids are used in the process. This is important in preventing fatigue through depletion of the muscle glycogen stores during sub maximal exercise. Fatigue during exercise using this form of ATP production is linked to the depletion of the muscle glycogen stores, an increase in muscle temperatures to a certain point, electrolyte depletion or imbalances rather than due to a lactate build up as little lactate is produced during aerobic metabolism. When sustained work is required, such as higher speeds being demanded from the horse, more energy is required to sustain these levels than can be obtained from ATP-PCr transform. ATP can also be formed by Glycolysis, which is the breakdown of glucose. Glucose accounts for about 99% of all blood sugars, and comes from the digestion of carbohydrates and the break down of liver glycogen. Glycogen is synthesized from glucose in a process called glycogenesis. Initially the glucose or glycogen used in this process must be converted into glucose-6-phosphate before it can be used to generate energy. The conversion of glucose requires one molecule of ATP. The conversion of glycogen is done by converting the stored glucose-1-phosphate is converted to glucose-6-phosphate (Wilmore and Costill, 2004) this is then converted into fructose-1, 6-diphosphate, which uses another molecule of ATP. This is then converted into two molecules of pyruvate, producing 4 molecules of ATP and 2 molecules of NADH. The final stages of anaerobic metabolism are the conversion of pyruvate to lactate, during which the NAHD is re oxidised. The pyruvate could also enter the mitochondria to enter the Krebs cycle. This process provides a quick way of producing energy in small amounts. However, a major limiting factor of anaerobic glycolysis is that it causes a build up of lactic acid in the muscles. In show jumping and eventing, the demands of the glycolytic system are high, and result in the acidification of muscles fibres and inhibits further glycogen breakdown because it impairs the function of the glycolytic enzymes. Fatigue in event horses has been associated with fluid and electrolyte losses as well as substrate depletion, whilst in racehorses lactate build up and substrate depletion are the principal causes. Due to the depletion of stored ATP through prolonged exercise recovery time will increase, as the stores must be replenished to the values preceding the event, which in some cases can take up to three days after a strenuous event. However no studies have been done into causes of fatigue in dressage or show jumping. The main aim of nutrition of the performance horse is to meet the nutrient requirements for the individuals and this correct feeding of horses is necessary to obtain peak performance by delaying substrate depletion and preventing accumulation of lactate, which will lead to fatigue therefore a reduction in performance. Energy must be provided in the correct quantity and form dependant on the discipline in which the horse competes with in as well as being tailored to each horse’s individual needs. When the energy demands of the horse increase relative to the increase of work being done, forage as a single source of food, and therefore energy is not a sufficient source to provide the required increased levels in energy. The horse needs to be fed according to the work done, so that as the demand for energy increases the food increase, where concentrated foods like oats are concerned, needs to be increased in proportion to the work done. This may be over looked or undetected by owners and may be last factor which is explored when problems with the horse’s performance become apparent. Our ability to feed the stable horse successfully on a dry and highly concentrated diet is a highly specialised art, which has been developed and perfected over many generations, as a result of practical experience and scientific study. Grazing is the natural system of feeding, and it is the successful adjustment of the natural to the artificial, lies the whole are of feeding the stabled horse and pony. Modern feeding practices away from natural grazing practices using high concentrate and low forage feeding regimes are associated with a number of disorders including: colic, gastric ulcers and tying up. The horse is designed to have small amounts of food in the stomach throughout the day, Colic results from the horse receiving smaller amounts of forage and generally low concentrate meals per day, than under natural condition’s thus disturbing the digestive disturbance. Best practice to overcome this disorder is by feeding high levels of forage on an ad-lib basis. Gastric ulcers are also caused by low forage diets and it most commonly seen in race and event horses and occurs because their is less saliva available, due to a reduction mastication so the stomach does not receive the antacid properties of the saliva. Again this can be aide by either increasing the forage the horse receives or turning the horse out to grass. A number of contributing factors lead to an episode of tying up (of which several forms have been recognized), including a build up of lactate in the muscles, which the horse is not able to remove quickly enough. This is due to a rapid breakdown of glycogen which is stored in the muscles for energy, recurrent exertional rhabdomyolysis – thought to be caused by an inherited gene in thoroughbred and also Arab breeds, this type of tying up is thought to be triggered by stress and excitability and also can be nutritionally related due to high cereal diets and polysaccharide storage myopathy may also be inherited but is also linked to excessive storage of carbohydrate in the muscle stores. The treatment for this is to feed as little concentrates as possible, increase the use of forage in the diet and supplementing the diet with oil for energy and also adding electrolytes. The horse has to rely on stored energy for work (cellular operations), as energy is not being supplied constantly during exercise, energy intake is discontinuous but energy expenditure is continuous, thus there is a constant alternation between positive and negative energy balance, stored energy being provided by: muscular glycogen, muscular triglycerides, stores within the adipose tissues and liver glycogen. At rest the body obtains its energy needs from the breakdown of carbohydrates and fats. During mild to sever muscular effort, more carbohydrate is used with less reliance on fats. In maximal short duration exercise, ATP is generated almost exclusively from carbohydrate. Or if on grass 40 kg of grass. These rations were from what Gassendi classed as class 1 feeds, namely Wheat, Barley, Oats, Barley Straw, Hay. Gassendi recommends as does the British Horse Society that the Hay should be of a good colour, the greener the better, smell pleasant, not musty or of vermin, be loose and shake out well, free from dust and disintegrated leafs, have no trace of damp or mould. Barley Straw was an additional bulk food, used when hay was not available, or what was available was not suitable as a feed and its nutritional value is often equal to poor hay, Gassendi noting that 5 kg of Hay was equal to 10 kg of Barley Straw. The barley straw could be chopped into fine pieces, which today is called chop and can be coated with molasses. In addition to the roughage or bulk feeds (Hay and Barley Straw), Oats where possible or Barley were to be added to the ration to provide carbohydrate, therefore energy in the form of Starch. The oats were to be plump, clean, sweet smelling and heavy. Oats were the staple part of the diet providing both carbohydrate and fibre, and are an ideal food for horses. Rye grass was also to be used as a bulk feed cut into short lengths in a chaff cutter and fed to the horse as an opener in the bulk feed, and is called today ready grass. Gassendi’s class two feeds were Alfalfa and Red Clover Straw. Alfalfa or Lucerne, is a very high concentrate in protein, and is an ideal feed for young and growing horses in work. Alfalfa and Red Clover Straw should be fed with care as they have a protein concentrate, but when used less concentrate foods are needed. Class 3 feeds consist of Legumes, Peas, Lentils, Field Beans. These have a high energy value and are high in lysine and thus a useful high protein food. Class 4 feeds consisted of Sugar Beet, Carrots, potatoes, which should be fed to horses in small quantities, and are often appreciated in the diet, carrots in particular and sugar beet making a valuable addition of carotene and calcium, salt and potassium and can be used to offset the cereal in balance. Gassendi’s recommended feed rations outlined above, which on average fed 12.5 kg of feed per horse regardless of size, based on modern feeding practice, the horses in the French artillery trains would have been over fed for the artillery train riding horses, the remainder being fed within accepted best practice. The BHS suggests that horses from 15.2hh to 16hh should be fed 11-17 kg of feed a day; the smaller wheel horses of 15hh to 15.2hh are recommended to be fed 10 to 14 kg of feed, and again would have been over fed, as would have the riding ponies and horses of the train, 14.2-15hh should have been fed 8-12 kg of feed a day. English artillery horses were to be 14.2hh to 15hh with apparently no differentiation between wheelers, leaders or riding horses in the artillery train. On ‘home service’ in quarters and doing light work, the horses ration was 7 kg Hay, 5 kg Oats and 2 kg Barley Straw, total 14 kg . Based on BHS recommended feeding allowance these horses were over fed and with nearly 1/3 of the ration being oats, received far more concentrate than required for the level of work undertaken. On campaign, the English horse was allocated a ration of 10 kg Hay, 5 kg of Oats. 2.5 kg Barley Straw, total 17.5 kg , a level of feeding the BHS allocated to horses of 17hh or more. In both England and France artillery horses feeding regimes match those of Hunters and Ednurance horses as outlined by the BHS, i.e. bulk food forming the staple part of the feed with 3.5 kg to 5.5 kg of concentrates. The French feed ration matches best BHS practice more closely than that of England . When the energy demands of the horse increase relative to the increase of work being done, forage as a single source of food, and therefore energy is not a sufficient source to provide the required increased levels in energy. The horse needs to be fed according to the work done, so that as the demand for energy increases the food increase, where concentrated foods like oats are concerned, needs to be increased in proportion to the work done. This may be over looked or undetected by owners and may be last factor which is explored when problems with the horse’s performance become apparent. The main aim of nutrition of the performance horse is to meet the nutrient requirements for the individuals and this correct feeding of horses is necessary to obtain peak performance by delaying substrate depletion and preventing accumulation of lactate, which will lead to fatigue therefore a reduction in performance. Energy must be provided in the correct quantity and form dependant on the discipline in which the horse competes or in our case works with in as well as being tailored to each horse’s individual needs. Indeed, Gassendi’s feeding regime treated the range of horses used by the artillery the same in terms of diet, and the energy spent during the daily work done replaced by appropriate feeding. The feeding regime out of necessity could not be tailored to individual horses needs, but appears to have provided the staple nutrients that the horses needed assuming that the ration was available. Early 19th century horse care in France was enlightened. The prescribed rations were not always available. Sometimes, especially as the war went on and areas were picked clean by the opposing armies, severe shortages of grain and hay developed. At other times, there was available grain and hay but they could not be delivered to the batteries needing them. Water for the horses was a problem that demanded an adequate solution every day. While in camp, a battery would discover the nearest creek or pond and routinely water the horses there. On the march, water had to be found at the end of each day. If the water was any distance, as it often was, the timing of the watering was critical. The guns were immobile if the horses were absent. Usually, only half the horses would be sent to water at any one time. This meant that in an emergency some movement might be achieved, but with only half the horses present, the battery was at a distinct disadvantage. In spite of the care given to artillery horses, the animals still perished at an astounding rate. Many died of disease or were put to death because of exhaustion. Many more were killed alongside their battery mates in battle. A limber is essentially a set of wheels which fit to the gun carriage or other vehicle to aid its movement over long distance. The most common form of limber was that using an A frame, with a single shaft allowing for tandem harnessing of the horses. The pintail was commonly mounted on the axel, but during the 18th century, the pintail moved to the bolster immediately behind the axel, as this made limber the gun easier and quicker. Placing the pintail on the bolster behind the axel was introduced by the Prussians in 1747, and the Austrians in 1753. William Congreve RA in 1776 noted that moving the pintail to this location allowed the gun and team to turn shorter as was frequently necessary to accompany infantry, and by mounting the ammunition box on the limber, it counteracted the weight of the limbered gun carriage and made the limber balance more evenly and was consequently easier to move by the horse team. In the 1788 design used in Britain the bolsters behind the axel were removed and the pintail was replaced with a bronze hook which connected to a protruding lunette ring mounted on the end of the trail. The removal of the third bolster, reducing the limber body to just longer than the diameter of the wheels to improving the turning circle and to make the vehicle lighter was a common trend throughout the period, France being the only major power to retain long limbers, Austria altered their limbers in 1813. The other form relied on a square platform, with the shafts for the horses or sweep bar attached to the first bolster. When a single sweep bar was used, this was often integral structural element of the platform of the limber. The square bodied limber, developed it seems in Britain in the 1780’s, was restricted to Britain and Bavaria; the A frame style being by far the most common type in use, some of which had a square platform mounted over the A frame as in Hannover and France post 1822. In the Napoleonic epoch, limbers existed in two types, with an ammunition box and those without. The limber with the ammunition box mounted on it was developed in 1747 in Prussia by Ernst von Holtzmann, who built an example at his own expense. His design was first copied in Austria in 1774, and then was the point of inspiration for other nations. The French were the only country to retain the limber without the box, apart for a few years between 1803 and 1808. The limber mounted ammunition box could carry more ammunition than the boxes which had been carried on the gun carriage, and in some designs doubled up as a seat for two gunners to ride on. The logical conclusion of the carriage mounted ammunition box was its development into a seat for the gunners to ride on as used in Austria , Bavaria, and Wurtemberg and was called a Wurst seat. In the Austrian, and Prussian system prior to 1812, the axle-tree was of wood, the elasticity of which helped to absorb some of the recoil of the gun, and were easier to replace in the field than cast iron. Also, the gun carriage longer than those of France and allied systems, which diminished the angle of incidence of the force of recoil, the actual recoil was diminished by the great weight of the carriage and the friction of the axle in the nave. In the French Gribeauval carriage and allied systems, the axles were of iron, and the nave-boxes of bronze, which decreased the friction greatly. Bronze boxes also had the advantage over cast iron, in that they were self lubricating. With the iron axel and iron box, the grease would greely mix with dirt and gravel and form a cutting paste, which would wear both the boxes and axel. Howitzer carriages which are light relative to their projectiles, strain their carriages a good deal, particularly when the firing is at angles of elevation. Thus, a Howitzer-carriage which will resist a horizontal fire perfectly, is liable to be broken when fired under a large angle. The only means to obviate this inconvenience is to favour the recoil at first. The gun-carriage and its limber united form a four-wheeled vehicle, which should satisfy the same conditions as other carriages. The wheels are always made with a certain convexity called the dish. The obliquity of the spokes gives elasticity to the wheel, and protects it from shocks which, were the spokes in the same plane, would destroy it. The dish should increase as the ground to be passed over becomes more broken. The object of the dish was for the purpose of making the body of the carriage wider, traditionally artillery wheels had not been dished as they were stronger, but dished wheels seem to have been an introduction of Lichtestein in Austria in 1753. The dished wheel also helped to diminish the length of the axle-tree, thus increasing its strength; to throw the mud and water outside the wheels; and to tend, from the effect produced by the decomposition of forces, to keep the wheel close against the carriage, and prevent any tendency for it to run off the axle if the linch pin was lost. As the weight of the carriage should not be increased beyond a certain point, it is only by making use of friction, skillfully applied, that the recoil can be diminished. The friction of a wheel is proportional to the ratio between the radii of the wheel and axle as well as the size of the felloes as shown by Benjamin Thompson. The recoil of the carriage may be diminished by decreasing the diameter of its wheels, but this limited the ease of mobility of a piece. However, the weight of the wheels, as it adds to the weight of the carriage, helped to diminish the recoil. If they are too heavy, they strain the axle-tree very much, and tend to bend it. The wheels slide along the ground at first, and commence to turn only after a certain length of time; but once they have acquired a certain velocity, they carry the carriage with them until this velocity is destroyed. The wheel is composed of a nave, into which the axle-tree enters; of a certain number of spokes fastened in the nave; and the circumference of the wheel, which is composed of a number of felloes equal to half the number of spokes. The wheels are always made with a certain convexity called the dish. The obliquity of the spokes gives elasticity to the wheel, and protects it from shocks which, were the spokes in the same plane, would destroy it. The dish should increase as the ground to be passed over becomes more broken. The object of the dish is, for the purpose of making the body of the carriage wider; to diminish the length of the axle-tree, thus increasing its strength; to throw the mud and water outside the wheels; and to tend, from the effect produced by the decomposition of forces, to keep the wheel close against the carriage, and prevent any tendency to run off the axle. As the weight of the carriage should not be increased beyond a certain point, it is only by making use of friction, skillfully applied, that the recoil can be diminished. The friction of a wheel is proportional to the ratio between the radii of the wheel and axle. The recoil of the carriage may be diminished by decreasing the diameter of its wheels, or increasing that of its axle. For this reason, certain carriages (as, for example, mortar-beds) have been mounted upon rollers, and others upon wooden axles, with truck wheels. The weight of the wheels, as it adds to the weight of the carriage, tends to diminish the recoil. If they are too heavy, they strain the axle-tree very much, and tend to bend it. The wheels slide along the ground at first, and commence to turn only after a certain length of time; but once they have acquired a certain velocity, they carry the carriage with them until this velocity is destroyed. In all kinds of carriages, the ease of draught was increased by enlarging the diameter of the wheels and decreasing the size and weight of the axles. Gibbons in 1859 noted however that there was little advantage in using wheels more than from 1.47m to 1.57m in. high. Those used in the French M1827 and M1803 systems were 1.52m and 1.48m in diameter. Increasing the diameter of the wheel diminishes the effort needed to move the vehicle in soft ground when compared to smaller wheels, as the large wheel bearing upon a greater number of points, makes a shallower rut. This is also the case with wide felloes. The large wheel, as demonstrated by Desaguliers in Britain and Scharnhorst in Prussia in 1812 also was advantageous for surmounting obstacles. One wheel twice the height of another will surmount, other things being equal, an obstacle twice as high as will the small wheel. Scharnhorst also demonstrated that as the dimensions of the wheel increase its weight and price become greater, so that beyond 1.47m, the advantages to be gained in a few particular instances were not sufficient to outweigh the objections to a further increase in diameter. Gibbons in America in 1859 and Valee in France in the 1820’s also noted that that if the axletree of the vehicle was higher than the breast of the horse, there was a decomposition in the tractive force, and the carriage would be difficult to manage in going down even the most gradual slopes. In this view, then, there is a limit to the size of the wheel for the use of the artillery. As the horse acts from the shoulder, when in harness the traces ought to be inclined downwards from that point. For an unloaded horse, the most advantageous angle of traction appears to be about 12º; but when the horse carries a rider, the shoulders already being loaded when placed in harness the most advantageous angle of the traces is reduced to 6º, which is about the angle made by having the wheels of the limber at no greater diameter that 1.47m. However as only one of the horses in each pair is ridden by the postilion driver, the angle of the traces to result in the most advantageous traction became about 9º needed wheels of less than 1.47m. Thus Britain having limber and gun carriage wheels of 1.53m, the toungue of the limber being level with the breast of the horse, was not affording the best traction and made the guns difficult to handle down slope. This was noted by French General Allix when the French Artillery Comite were discussing adopting the English artillery system. Thus desaguliers was right in that the 1.53m was the most efficient in overcoming obstacles but did not afford the most efficient mode of draught. Neither were Gribeauval and Lichtenstein correct with having smaller fore wheels on guns and vehicles, AnXI fore wheels in France being the optimum size. The Gribeauval system however with the limber wheels of 1.12m, were considered to be two smaller to allow movement over rough ground, as when the vehicles are designed to pass over very unequal broken ground, there is an advantage in the wheels of both parts being equal in height; for, were they unequal, the smallest-turning the quickest to get over the same distance-- experience more resistance, and often slide in place of turning; besides which, a small obstacle, such as a stone, would suffice to stop them, hence the adoption of larger wheels was necessary. When the ground passed over is very undulating, there is an advantage in the two parts of the carriage being connected by a single point, for then they might be on differently inclined ground without hampering or dragging each other. The force of traction of the limber is then applied to the axletree of the rear carriage, and its action is as direct as possible. National Research Council, (1989), Nutrient requirements of horses 5th revised edition, National Academy of Sciences, USA. French cavalry and artillery never moved at the Gallop, the Au Gallop noted in manuals was in fact equivalent to the canter. References to the cavalry moving at the gallop probably have translated au gallop as gallop, rather then the correct canter. Au Charge was equivalent to the gallop. Cotty in the 1832 supplement to the artillery dictionary recommends that battle field movements be carried out at the trot, and the gallop in excepional circumastances (Cotty H 1832 Supplement au Dictionaire artillerie Paris). Gibbon (1863), The Artillerist's Manual, p. 363. Wilmore and Costil: 2004; 120. The British Horse Society recommends that a horse on light to medium work requires its feed to be 80-90% Bulk food and the remainder Concentrate or Short feeds, which the ration designed by Gassendi equates to, with 80% rough from Hay and Barley Straw and the remainder from oats. The Barley Straw nutional value equates to half that of the Hay. Very little has been researched into the energy intakes of the differing disciplines, especially show jumping. Some recommendations have been made as to which category each event should be classes as, such as light, medium or hard work but varying levels of these disciplines can change this drastically. For example ‘Feeding and care of the horse’ (Lewis 1995), classes jumping as medium work, equitation as light work but does not have specific recommendations for eventing or dressage. However ‘The Horse Nutrition Bible’ (Bishop 2003) defines light work as: hacking, showing at local level, prelim/novice dressage, BSJA to discovery level, novice event horses and endurance horses up to 20 mile rides. Medium work is classified as affiliated showing, medium/advanced medium dressage, intermediate eventing, BSJA grades A and B and some racing work. Hard work is then classed as grand prix dressage, 3 or 4 star eventing and racehorses in full training. There are no clear guide lines in place to define light medium and hard work and so when calculating a feeding regime it is easy to put the horses working level at the wrong intensity. The BHS recommends for heavy work, that 30-40% of the feed should be concentrate, which Gassendi’s recommendation comes close to, and based on modern practice would appear to be overfed bulk food. The harder a horse works, in the case of artillery horses on campaign, very hard, the more concentrates are needed in the diet, which they do not appear to have received based on Gassendi’s recommendation. In general, based on modern practice, French artillery horses were overfed and received insufficient concentrate. Scharnhorst cited by Allix (1827) in Journal Science Militaire Tome VIII p159 see also Anonymous (1827) Observations sur les changemens qu’il paraîtrait utile d’apporter au matériel et au personnel de l’artillerie”, in ‘Le Spectateur Militaire’, Tome troisième Paris pp. 129-159.